Now, I don’t have many photos of the original mantle. However I can tell you a bit about it. I started with a cloak pattern and modified the heck out of it. However I could not figure out how to get the dagged edge to look the way I wanted. The fabric I was using had a fairly directional pattern woven into it. So for version 1 I skipped the dagged edge and only made two drape layers. Then I decided to remake it, to achieve that dagged edge. I cut out the tabs individually and attaching them to a short layer of the mantle, so that the direction is vertical on all of them. I hid the seam with a middle layer of drape. However my local fabric stores stopped carrying the fabric I originally selected for the hood. So, instead I attached the tabs to a muslin base that is hidden by the upper layers of the mantle. Sadly it was a stormy day when I took these first photos, so the lighting is terrible. 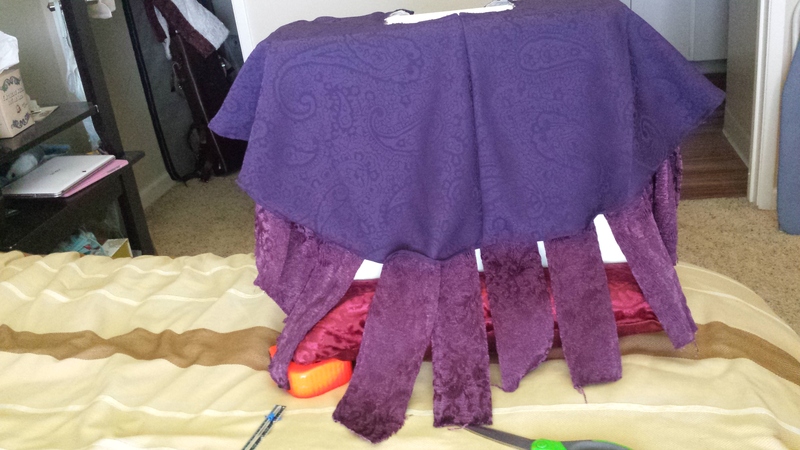 I pinned the tabs to the muslin using the two pattern pieces for the other layers of the mantle as a guide for the minimum and maximum lengths to make the tabs. I tacked a lightweight middle layer over the muslin. You can see the tabs attached, but the tabs have not been trimmed to their final lengths. Measuring tape and scissors for size reference. And yes, that is my sewing machine hutch that it’s draped over. I’m still saving up to get a dress form. >_>; Some day, dress form, some day. The asymmetry looks better once it’s incorporated with the rest of the mantle. Some close ups of the finished hood! I’m actually really fond of how the long tabs look in the back.